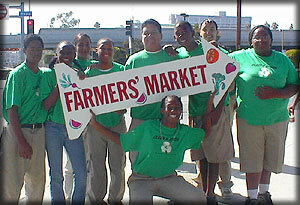 Members of the Los Angeles Conservation Corps "Clean and Green" group promote a neighborhood farmers' market. If you are a farmer/grower, prepackaged food vendor, hot food vendor, or artisan/crafter and would like to sell at a Southland Farmers Market Association (SFMA) certified farmers market, the following includes some of the licensure and certifications that are required. Producer's Certificate: You must have a current producer certificate from the Office of County Agriculture Commissioner where your farm is located to sell in a certified farmers market. SFMAs The Directory: Make sure you have an application on file with Southland Farmers Market Association so you can be notified of opportunities in new or existing markets. Visit markets that you would like to sell at and introduce yourself to the market manager. Keep the market managers informed about your availability and products.  You must make your product in a Health Department approved facility. No food prepared or stored in a private home may be used, stored, served, offered for sale, sold, or given away at a farmers market. SFMAs The Directory: Fill out a vendor application and submit it to Southland so we can notify you of new or existing market opportunities. Contact individual market managers by telephone or by visiting the market to see if they have an interest adding you to their market. Note: Each market may have additional permits and or licenses that may be required depending on local ordinances, i.e., resellers license. Department of Health Services: You will be required to have your own stainless steel three compartment sink. Contact you countys Department of Health Services for details. The Department of Health Services will provide you with information on the additional requirements needed to comply with the California Uniform Retail Food Facilities Law (CURFFL). Contact individual market managers by telephone or by visiting the market to see if they have an interest adding you to the market. Contact the market manager for the market(s) that you are interested in for further information. Please submit a craft vendor applications to Southland. Southland does not accept or retain applications submitted by artisans and crafters. You must contact each individual market manager to find out if the market accepts crafters, the cost of booth space, permits and licenses required, and if space is available.